I did clean it, so it's ready for use with new thermal paste. I used it for a Pentium g4400 and it worked great! New, never used, with thermal paste untouched. Intel CPU Heatsink LGA1150 LGA1151 LGA1155 LGA1156 Fan Stock Cooler i3 i5 i7. Intel OEM Copper CPU Heatsink Fan Stock Cooler LGA1150 LGA1151 LGA1155 LGA1156. Shipped with USPS Priority Mail. Its for Core i7, i5, i3, Xeon, Pentium & Celeron processors. Refer to the pictures to see how the item looks like. I’m a reasonable person & will try to work with you to resolve whatever issue you are having with a particular item. These are the non-copper core version. Each lot includes ten (10) fans. We reserve the right to choose the carriers. 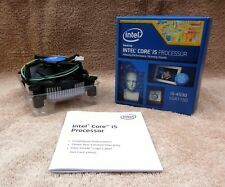 NEW!_Intel Cooler Fan E97379-003 for i3-6100_LGA 1151_CPU_In Stock! CPU Type socket: LGA 1151. [CPU is not included.]. Fan Speed (RPM): 2600 RPM. Fan Directions: 4. Pin of the fan: 4. Heat Sink Material: Aluminum. 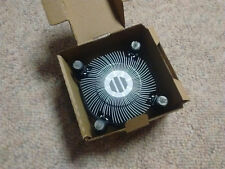 I am selling the stock heatsink/fan that came with my i7-3770 cpu. I only used it for a very short time before I decided to try other coolers and it’s been kept in box ever since. Because I did initially use it, I had to remove the thermal paste. What you see in the photo is what you get. Does NOT include the cpu, cooler only. Intel OEM CPU Heatsink Fan Stock Cooler LGA1150 LGA1151 LGA1155 LGA1156. These are working pulls and have been cleaned of old thermal compound. Will ship Heatsink but will not come with thermal paste. Message if you want some applied before shipping or for combined shipping details. 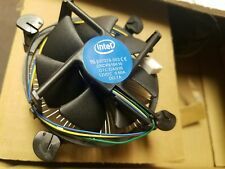 Intel E29477-002 CPU fan and heatsink only, no CPU included. This was an opened package but was never installed or used. Comes in original packaging. Trending at $10.74eBay determines this price through a machine learned model of the product's sale prices within the last 90 days. Intel OEM Copper CPU Heatsink Fan Stock Cooler LGA1150 LGA1151 LGA1155 LGA1156. Fan is like new and has never been used, as I installed an aftermarket cooler from the beginning. Shipped with USPS Priority Mail. 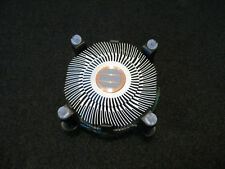 Intel OEM All Aluminum CPU Heatsink Fan Stock Cooler NO CPU. Condition is Used. Shipped with USPS Priority Mail. NO CPU INCLUDED came with a haswell lga 1150 cpu. should fit most sockets. 5 of 6 have the copper slug on the bottom, one of them is aluminium only. Brand New Intel Stock cooler. Intel OEM Copper CPU Heatsink Fan Stock Cooler LGA1150 LGA1151 LGA1155 LGA1156. Condition is Used. Shipped with USPS Priority Mail. Item is brand new, never used. 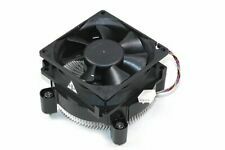 Have many quantities available, the listing is per heatsink fan. Thanks. Trending at $7.19eBay determines this price through a machine learned model of the product's sale prices within the last 90 days. In good condition and fully operational. Comes in generic box. Heat sink was paired with an i5-4690k cpu. Trending at $10.49eBay determines this price through a machine learned model of the product's sale prices within the last 90 days. This item in very good condition. Intel OEM Copper CPU Heatsink Fan Stock Cooler LGA1155 for i3, i5, i7. Condition is Used. Shipped with USPS Priority Mail. Trending at $8.67eBay determines this price through a machine learned model of the product's sale prices within the last 90 days. Intel E97379-003 Socket LGA 1150/1155/1156 4-Pin Connector Stock OEM CPU Cooler Condition is Used. Shipped with USPS First Class Package. Was in my old pc, don’t need anymore, worked perfectly. Type Heat Sink with Fan. Pin Connector 4-pin Fan Connector. Condition is Used. As a result, you can get one for your project on the cheap! Intel CPU Heatsink LGA1150 LGA1151 LGA1155 LGA1156 Fan Stock Cooler. Condition is New. Shipped with USPS Priority Mail. Intel Celeron/Pentium/Core2 Duo/Quad LGA 775 4pin Stock CPU Cooler Thermal Paste. Condition is Used. Shipped with USPS First Class Package. Intel OEM Copper CPU Heatsink Fan Stock Cooler LGA1150 LGA1151 LGA1155 LGA1156. Condition is New. Local pickup only. For sale here is an Intel stock cooler pulled from a working system. Fits most modern Intel CPUs. Model E97379-001 - LGA1150 1151 1155 1156. It will fit socketsLGA1150 (H3), LGA1151, LGA1155 (H2), LGA 1156 (H). Heatsink material: Aluminum. Type: Heat Sink with Fan. Fan Model E97379-001. Max fan speed: 2500 RPM.